BrewDog have signed a lease for the former Blind Tiger Club almost exactly a year after it closed due to noise complaints. The pub is set to open later this summer after a big refurb. The independent Scottish brewery, which runs 27 bars around the world, announced its interest in setting up shop in Brighton last year, but delayed the move for legal reasons. Though it seems like there might be other factors involved in the timing. Today the outspoken craft ale hipsters pulled off an audacious stunt when they flew over London dropping stuffed cats out of a helicopter. According to BrewDog co-founder James Watt, the ‘fat cat’ blitz was a “glorious combination of art, guerrilla warfare, taxidermy and feline sartorial elegance”. The publicity/propaganda stunt was promoting a crowdfunding share sell off which has already earned the company £5m in 20 days. Despite (or perhaps because of) its outsider attitude, BrewDog has been the fastest growing food and drinks company for three years on the trot and recently valued itself at a staggering £283m. 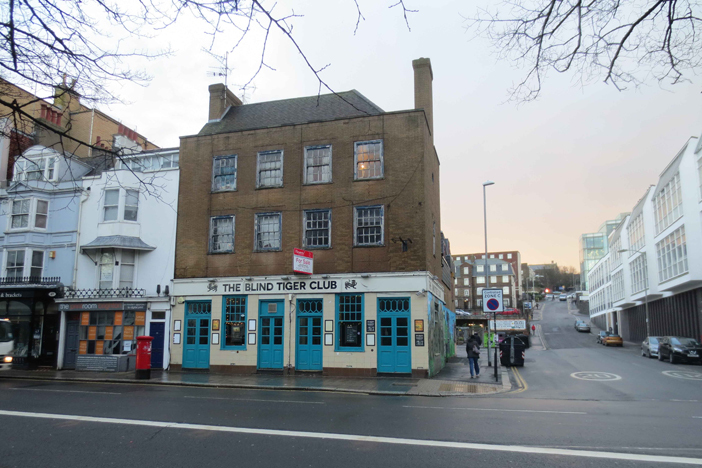 The Blind Tiger was formerly run by local promoters Playgroup, who claimed the venue was forced to close following noise complaints from a single resident who’d moved into a flat a few feet above the stage. However, the Council says the complaints came from three different residents on nearby streets. In any case, a petition was launched to save the much-loved venue, getting over 15,000 names, but the impending fines were the final nail in the coffin for the Playgroup guys who’d had a hard time of it ever since their festival was cruelly rained off in 2012.